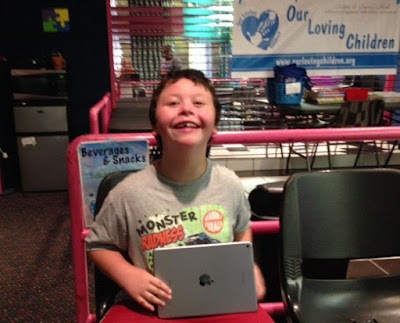 We hope you enjoy the new school year with your new iPad Maxwell!! 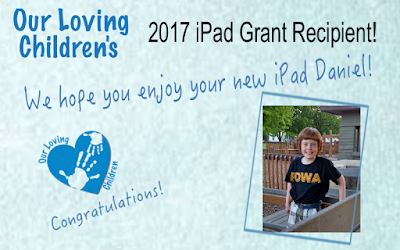 We are thrilled to announce the winner of our 2017 iPad Grant Giveaway! We are thrilled to announce the winner of our 2016 iPad Grant Giveaway! Thank you for submitting your iPad grant application to Our Loving Children. 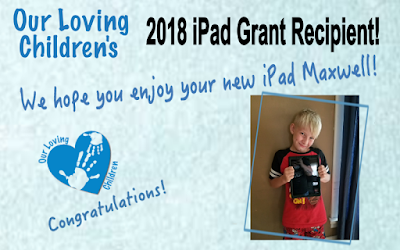 At our meeting, the Board of Directors of The Our Loving Children Non-Profit Organization, carefully considered all requests to be awarded the iPad in our annual iPad Give-Away Grant. Although we would like to respond affirmatively to all requests, we received far more applications than our relatively limited resources will permit. It is a disappointment to us that we must decline many worthy grant recipients. We are appreciative of the information forwarded to us and the time and effort expended in preparing the applications. We are very excited to announce that we have awarded one applicant with the iPad! For those of you who we could not help at this time, we would love for you to keep us in mind for any future needed support and resources.